The Badgers went .500 this weekend in their first conference matchup against the unranked University of Michigan Wolverines. 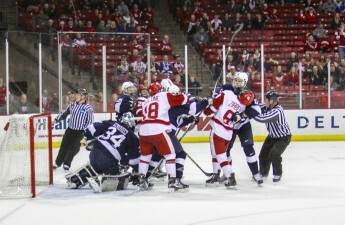 Wisconsin fell behind 2-0 midway through the first period on two Michigan power play scores. 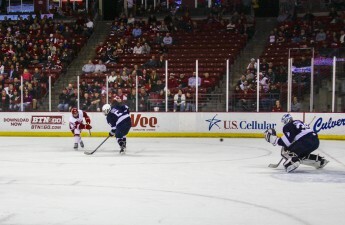 The Badgers would respond late in the same period when freshman Trent Frederic found the back of the net to cut the lead to one. Frederic’s goal would ignite the Badgers as they lit up the second period, outscoring the Wolverines 5-1 to build a sizable 6-3 lead. “Everybody was feeding off of each other, everybody was positive on the bench, but definitely that energy I mean when someone scored it felt like everyone had scored,” Wisconsin senior forward Aidan Cavallini said. 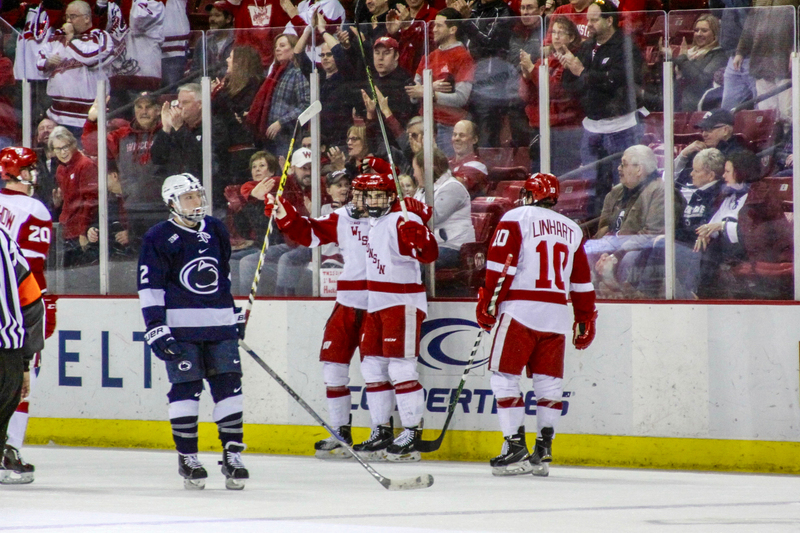 The Big Ten foes would both score a single time in the third period to end the first game of the series in a dominating 7-4 performance by the Badgers. 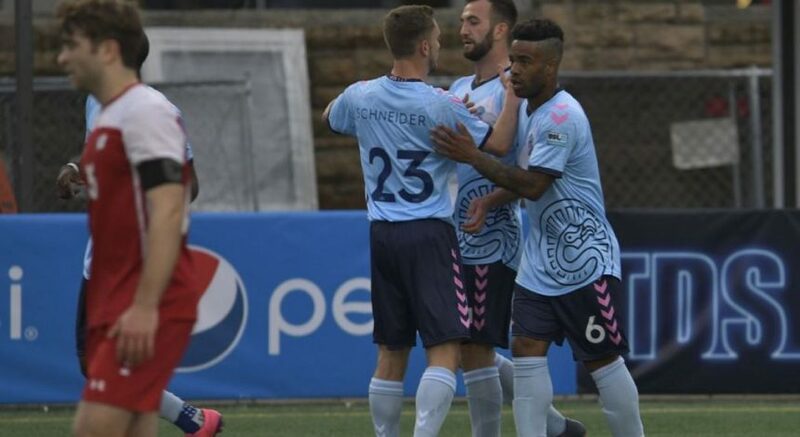 Sophomore forwards Luke Kunin and Will Johnson both had no problem finding the back of the net as each of them scored a pair of goals in the offensive feast. Their fellow forward, junior Ryan Wagner, would finish the night with the assist hat trick finding his teammates on three of the seven Badger scores. Saturday’s contest would tell a different story despite a similar beginning for Wisconsin. The Badgers, again, fell behind 2-0 in the opening period but could not muster up the same offensive rebound from the night before. A power play score from senior Grant Besse was the only shot Michigan goaltender Hayden Lavigne let by him the entire night in a sensational 34-save redemption performance from the night before. Wisconsin shut down the Wolverine attack in the last two periods, excluding the two empty net goals at the end of the third. The offensive success from a night before did not carry over as Michigan thwarted any chances the Badgers leaving Ann Arbor with a clean sweep. Ryan Wagner finished the weekend on the road with four points moving him up to the fourth spot on the team’s leaderboard. Luke Kunin had a prolific showing as well, scoring twice on Friday and recording an assist on the single Badger goal Saturday night. A road split in conference play — especially on the road — is far from the worst thing for a Wisconsin team who has struggled mightily the last couple years in the Big Ten. Conference play continues after a winter hiatus on Jan. 6, when Michigan State University travels to Madison for the Badgers’ first Big Ten home series of the season.